Mismatched Earrings : Which celebrities wear them the best way? It looks as if mismatched earrings are here to stay and why shouldn’t they? Asymmetry means fun and, when combined with jewelry, it also means a great style. This years’ fashion shows around the world have seen a lot of asymmetries, including mismatched earrings. And because Ana Luisa is the go-to place when you want to find out how to style different types of earrings, today we are going to share with you some news from the celebrities’ world. Read further to discover which celebrities wear the mismatched earrings trend the best. Before we get started with our gossip, we want to share with you some style guidelines for wearing mismatched earrings. This may be a creative and unconventional trend, but as with everything in life, some rules still apply. The most important rule when wearing mismatched earrings is to have a common element between them. Whether it is the same color, material, shape or theme, it is up to you. An opposite effect can also be considered a common element. For example, a stud earring with a long dangle earring. If you are wearing mismatched earrings, your outfit needs to be simple. To create a fashionable effect, you need to let your earrings stand out, so choose a neutral outfit over patterns and vivid colors. Pay attention to your hairstyle so that both of your earrings show. You can also wear an asymmetrical hairstyle if you want, but let both of your earrings be visible. As celebrities inspire us and help you get more stylish ideas, we have decided to put them under a microscope and share some of the best mismatched earrings looks we have seen so far. Let the gossip begin! She has an impeccable style and we love her for her strong beliefs and smart looks. Emma Watson is always a style icon and when it comes to mismatched earrings, there is no exception to this rule. Here she has chosen to wear a delicate diamond stud earring with an extra-long linear drop earring and the effect is remarkable. She has achieved an asymmetrical yet balanced look that emphasizes her features. The beautiful blonde actress is always an example of good taste and style. She was one of the first celebrities to adopt this trend and she has brought it to a masterpiece. Her beautiful pair of mismatched earrings consists of a gemstone cluster earring and a stud earring featuring the same set of gemstones. Elegant, unconventional and bold, Scarlett Johansson is one of our favorite celebrities when it comes to wearing different earrings. The beautiful Irish actress who is known for her role in Atonement, as well as her recent Lady Bird role, chose to wear a pair of mismatched earrings that are very elegant and stylish. They have the same shape and length but feature different gemstones which offer Saoirse’s look a unique touch. Combining different gemstones for identical earrings is a great way to wear different earrings but maintain a common element. The “Girls” superstar chose to play in a different way with her mismatched earrings. The common element was that both earrings had the same finish. One of them has a sparkle ladder shape, while the other one is a linear drop earring. Going where no royal has ever gone before, Meghan Markle makes a bold and very stylish choice. She decided to wear a pair of mismatched studs that looked gorgeous on her. While more subtle than our previous examples, Meghan’s earrings are still cool and very trendy. If you are new to this trend and want to make sure you get it right, why not buy a pair of earrings that are already mismatched? At Ana Luisa, you will discover some stylish and unique creations that will help you adopt this trend and master it. 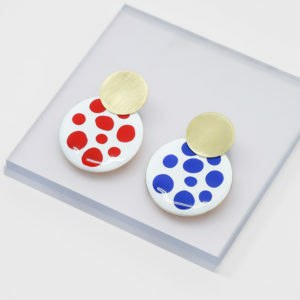 For example, our Kinoko asymmetrical earrings below will look gorgeous when you wear them to a cocktail party. Dipped in 14k gold and with an artistic enamel layer, these earrings will grab all the attention and help you take your personal style to the next level. And if you love your hoops, then we have a surprise: Sekai mismatched hoops by Ana Luisa. 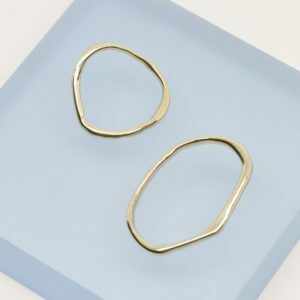 Freeform and dipped in 14k gold, these hoops have a uniquely fresh design and will always add a contemporary touch to your outfit. 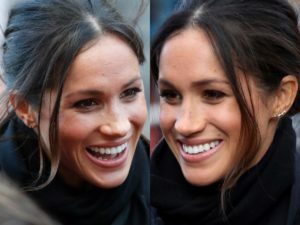 If you want to go for something more subtle, like Meghan Markle, check out Ana Luisa’s Isabelle mismatched studs. 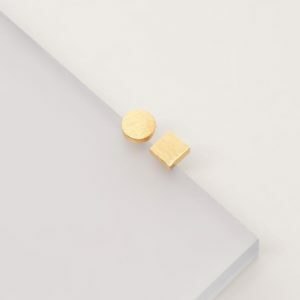 Cute, subtle and very fashionable, these studs are ideal for everyday wear. Visit Ana Luisa online jewelry shop to discover our unique jewelry collections. Each of our creations is limited-edition so make sure you get what you want today. Which Style of Drop Earrings Is the Best for You? Boho Earrings: What are they and how can I rock them? How to wear mismatched earrings?